Who is Saint Rita of Cascia? 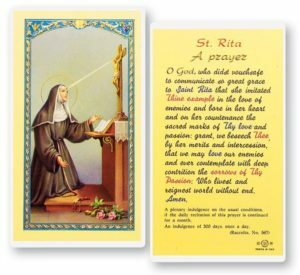 Home » Female Saints » Who is Saint Rita of Cascia? As Rita was growing up, her parent happily supported her desire to live a life of prayer and setup an oratory in their home. Although they were reluctant when at age 12, Rita decided to fully dedicate herself to God. They won out and were able to give her in marriage at the age 18 to a impulsive young man. After 18 years of marriage and 2 sons, Rita lost her devoted husband and shortly after her 2 sons. One night as Rita was praying she heard her name called out and was transported to another place. This miracle astonished the Augustinian Nuns who received Rita, and soon enrolled her among their number. 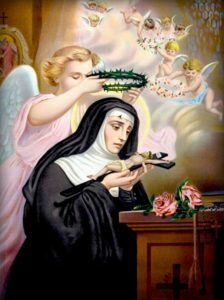 St. Rita’s humble life was distinguished by obedience and charity. Let me, my Jesus share in Thy suffering, at least of one of Thy thorns. Her prayer was answered. Suddenly one of the thorns detached and fastened itself in her forehead so deeply that she could not remove it. The wound became worse and was there for a long time. Rita was granted permission to attend the Jubilee at Rome on the condition that her wound was healed. Her miraculous power was recognized once this happened, but the wound then returned when she returned to the monastery. As St. Rita was dying, she asked for a rose from her old home. Even though it was not the season for roses, there was one waiting in full bloom. For this reason roses are blessed in the Rita’s honor.